I dare say that you may be surprised to find, O son of Cleinias, that I, who am your first admirer, not having spoken to you for many years, when the rest of the world were wearying you with their attentions, am the last of your lovers who still speaks to you. I therefore here present myself before you, and I greatly hope that no similar hindrance will again occur. Meanwhile, I have observed that your pride has been too much for the pride of your admirers; they were numerous and high - spirited, but they have all run away, overpowered by your superior force of character; not one of them remains. And I want you to understand the reason why you have been too much for them. You think that you have no need of them or of any other man, for you have great possessions and lack nothing, beginning with the body, and ending with the soul. and who can do as he pleases not only in this city, but in all Hellas, and among many and mighty barbarous nations. you have overcome your lovers, and they have acknowledged that you were too much for them. Have you not remarked their absence? And now I know that you wonder why I, unlike the rest of them, have not gone away, and what can be my motive in remaining. Perhaps, Socrates, you are not aware that I was just going to ask you the very same question - What do you want? And what is your motive in annoying me, and always, wherever I am, making a point of coming? I do really wonder what you mean, and should greatly like to know. But I shall reveal other thoughts of yours, which you keep to yourself; whereby you will know that I have always had my eye on you. Alcibiades, will you live as you are, or die in an instant if you are forbidden to make any further acquisition?–I verily believe that you would choose death. Before many days have elapsed, you think that you will come before the Athenian assembly, and will prove to them that you are more worthy of honour than Pericles, or any other man that ever lived, and having proved this, you will have the greatest power in the state. When you have gained the greatest power among us, you will go on to other Hellenic states, and not only to Hellenes, but to all the barbarians who inhabit the same continent with us. but the world, as I may say, must be filled with your power and name - no man less than Cyrus and Xerxes is of any account with you. Well, Socrates, but what have my hopes to do with the explanation which you promised of your unwillingness to leave me? And that is what I am now going to tell you, sweet son of Cleinias and Dinomache! and this I conceive to be the reason why the God has hitherto forbidden me to converse with you, and I have been long expecting his permission. and to show you that neither guardian, nor kinsman, nor any one is able to deliver into your hands the power which you desire, but I only, God being my helper. but now, having his permission, I will speak, for now you will listen to me. ALCIBIADES: Your silence, Socrates, was always a surprise to me. I never could understand why you followed me about, and now that you have begun to speak again, I am still more amazed. Whether I think all this or not, is a matter about which you seem to have already made up your mind, and therefore my denial will have no effect upon you. But granting, if I must, that you have perfectly divined my purposes, why is your assistance necessary to the attainment of them? Can you tell me why? but that is not my way. I think, however, that I can prove to you the truth of what I am saying, if you will grant me one little favour. SOCRATES: You do, then, mean, as I was saying, to come forward in a little while in the character of an adviser of the Athenians? Alcibiades, you are getting up to advise the Athenians - do you know the matter about which they are going to deliberate, better than they? this is the sum of your accomplishments, unless there were some which you acquired in secret; and I think that secrecy was hardly possible, as you could not have come out of your door, either by day or night, without my seeing you. SOCRATES: Whether he be little or great, good or ill - looking, noble or ignoble - makes no difference. SOCRATES: I suppose, because you do not understand shipbuilding:–is that the reason? would you, or the master of gymnastics, be a better adviser of them? SOCRATES: And can you tell me on what grounds the master of gymnastics would decide, with whom they ought or ought not to close, and when and how? Would he not say that they should wrestle with those against whom it is best to wrestle? SOCRATES: And as you speak of an excellence or art of the best in wrestling, and of an excellence in playing the lyre, I wish you would tell me what this latter is;–the excellence of wrestling I call gymnastic, and I want to know what you call the other. what is that art of which playing and singing, and stepping properly in the dance, are parts,–what is the name of the whole? I think that by this time you must be able to tell. what do you call the Goddesses who are the patronesses of art? and what is the excellence of the art of music, as I told you truly that the excellence of wrestling was gymnastic - what is the excellence of music - to be what? as the more musical was the more excellent, or the more gymnastical was the more excellent, tell me, what name do you give to the more excellent in war and peace? What do you mean, Alcibiades, by the word ‘better’? are you not ashamed, when you are asked, not to be able to answer the question? Well, then, consider and try to explain what is the meaning of ‘better,’ in the matter of making peace and going to war with those against whom you ought to go to war? To what does the word refer? SOCRATES: But you surely know what the charges are which we bring against one another, when we arrive at the point of making war, and what name we give them? SOCRATES: And how does this happen? Will you tell me how? For, there may be a difference in the manner. ALCIBIADES: That is an awkward question; for certainly, even if a person did intend to go to war with the unjust, he would not admit that they were unjust. SOCRATES: But how is this, friend Alcibiades? Have you forgotten that you do not know this, or have you been to the schoolmaster without my knowledge, and has he taught you to discern the just from the unjust? Who is he? I wish you would tell me, that I may go and learn of him - you shall introduce me. tell me, then, who this instructor is, if he exists. SOCRATES: Very good; and can you tell me how long it is since you thought that you did not know the nature of the just and the unjust? What do you say to a year ago? Were you then in a state of conscious ignorance and enquiry? Or did you think that you knew? And please to answer truly, that our discussion may not be in vain. SOCRATES: And more than four years ago you were a child - were you not? not hesitating at all about the nature of the just and unjust; but very confident - crying and shouting that one of the boys was a rogue and a cheat, and had been cheating. Is it not true? SOCRATES: And how can you say, ‘What was I to do’ ? if at the time you did not know whether you were wronged or not? SOCRATES: And when did you discover them - not, surely, at the time when you thought that you knew them? SOCRATES: And when did you think that you were ignorant - if you consider, you will find that there never was such a time? now, if you have neither discovered nor learned them, how and whence do you come to know them? whereas, in truth, I learned them in the same way that other people learn. 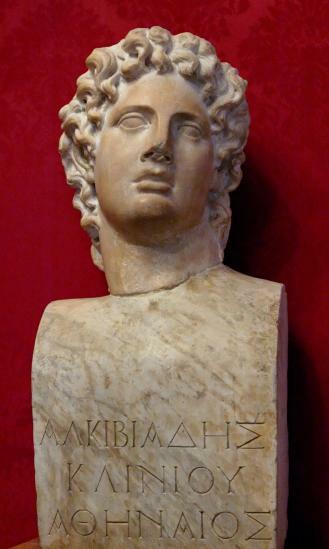 ALCIBIADES: Why, for example, I learned to speak Greek of them, and I cannot say who was my teacher, or to whom I am to attribute my knowledge of Greek, if not to those good - for - nothing teachers, as you call them. SOCRATES: Why, - because they have the qualities which good teachers ought to have. SOCRATES: Well, but do you imagine that the many would differ about the nature of wood and stone? are they not agreed if you ask them what they are? and do they not run to fetch the same thing, when they want a piece of wood or a stone? And so in similar cases, which I suspect to be pretty nearly all that you mean by speaking Greek. SOCRATES: But if we wanted further to know - not only which men are and which are horses, but which men or horses have powers of running, would the many still be able to inform us? SOCRATES: And suppose that we wanted to know not only what men are like, but what healthy or diseased men are like - would the many be able to teach us? for you have heard of the Iliad and Odyssey? SOCRATES: And when the Athenians and Lacedaemonians and Boeotians fell at Tanagra, and afterwards in the battle of Coronea, at which your father Cleinias met his end, the question was one of justice - this was the sole cause of the battles, and of their deaths. if you have neither learned them of others nor discovered them yourself? SOCRATES: Then who is speaking? I who put the question, or you who answer me? SOCRATES: Now let us put the case generally: whenever there is a question and answer, who is the speaker,–the questioner or the answerer? SOCRATES: Did not someone say that Alcibiades, the fair son of Cleinias, not understanding about just and unjust, but thinking that he did understand, was going to the assembly to advise the Athenians about what he did not know? nor did I say this, which you erroneously attribute to me, but you yourself, and what you said was very true. For indeed, my dear fellow, the design which you meditate of teaching what you do not know, and have not taken any pains to learn, is downright insanity. Many persons have done great wrong and profited by their injustice; others have done rightly and come to no good. ALCIBIADES: Why not, Socrates?–But I am not going to be asked again from whom I learned, or when I made the discovery. the old argument is a worn-out garment which you will no longer put on, but someone must produce another which is clean and new. –Where did you learn and how do you know the nature of the expedient, and who is your teacher? All this I comprehend in a single question, and now you will manifestly be in the old difficulty, and will not be able to show that you know the expedient, either because you learned or because you discovered it yourself. and simply request you to say why you do not explain whether justice and expediency are the same or different? And if you like you may examine me as I have examined you, or, if you would rather, you may carry on the discussion by yourself. SOCRATES: And is not the same person able to persuade one individual singly and many individuals of the things which he knows? The grammarian, for example, can persuade one and he can persuade many about letters. SOCRATES: Answer my questions - that is all.